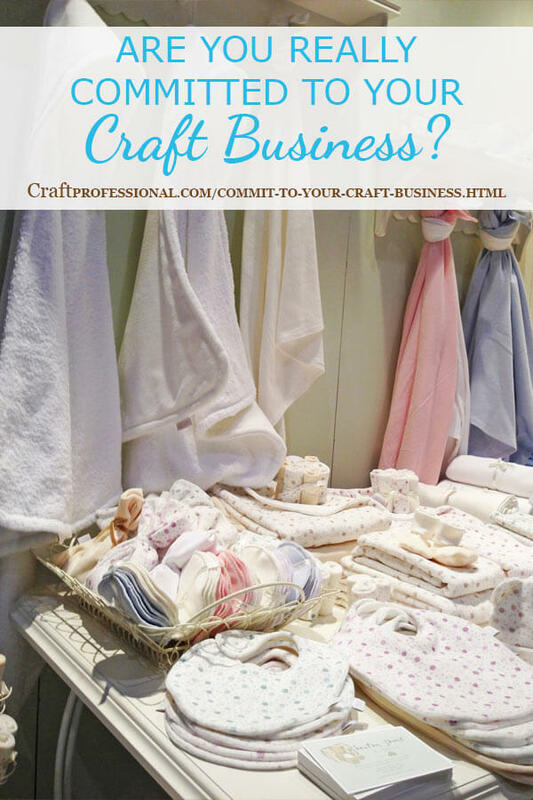 Are You Really Committed to Your Craft Business? One of the real perks of running a craft business from home is the fact that you can start as big, or a small as you like. You can run your business on a shoestring budget if necessary, or you can spend more up front. You can do it on a part time basis to fit around your day job and other responsibilities, or you can devote many, many hours to it. 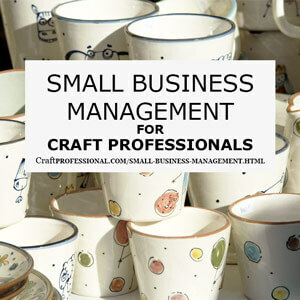 A craft business can take a lot of forms, and you should be able to find some form that works with the time and money resources you have available. However, even if you're building your business on a shoestring budget with limited time, you still absolutely must commit to investing in your business if you want to grow it beyond the hobby stage. 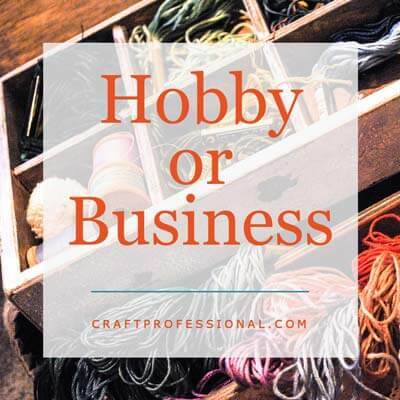 If you want to keep your craft-selling on a small hobby level, that is perfectly valid too, but too many people have the intention of growing a business, but approach it like a hobby. When you're starting out, it can be extremely tempting to just try to naturally "fit" your business tasks randomly around the rest of your life. This temptation can be particularly strong if you don't have time sensitive tasks lined up - a customer waiting on an order, for example. The danger in this approach, though, is that tasks never get done, andyou never make your business a top priority. There's always something else that seems more pressing. The nature of my work has evolved, but I have been self employed and working from home since 2005. Initially, it required a bit of learning to make sure I had the time I needed to accomplish everything. It really helps to find regular, dedicated slots in your weekly schedule to focus and work on your business. Work out how much time you need to devote to growing your business, then look at your calendar and your current commitments, and determine where you can find that time. Once you carve out that time, stick to it as much as possible! Don't wait for your business to just naturally fit within your life. It probably won't without some effort. Usually, the biggest challenges around setting and committing to fixed work hours are the expectations of other people. The next two points provide some ideas for getting other people on board with your new time commitments. You don't necessarily have to commit to paying for expensive childcare to find stretches of time to focus on your business. If you get creative, you might find a family member (I don't know where I'd be without my mom) who can help out, or a friend who's willing to take turns with childcare (you babysit your friend's kids one day, your friend babysits your kids another day). Or maybe you need to set your alarm an hour or so earlier in the morning (yes, I know, less sleep...) so you can start working before the rest of your household is awake. Whatever solution works for you, if you have young kids, you will need to find regular time to escape from them to focus on your business. Be prepared that some people in your life won't understand that you are really working - on a business - that is serious - that requires your undivided attention. I'm convinced if I was an accountant, or an architect working from home, people would respect the fact that I need to focus, complete projects, and commit to certain work hours. But when people don't completely "get" what you do, or they think your work is just a lot of fun, they don't always respect your work time. When I started working from home full time, somehow I suddenly became the person people came to when they had errands that needed to be done during office hours. I once had a friend tell me that she always called to chat on a certain day and time because she knew I worked at that time; therefore, she knew I would be at home to get her call! Ugh! So, maybe I'd rather chat with my friend than balance my books, and maybe I find it tough to say no to people who need a favor, but the reality is, my business won't grow itself without me investing time in it. You will need the strength to shut down (usually kindly and gently works) people who don't value your work time. For me, saying no a few times was enough to teach people that I was not available to run all of their errands or chat during my work hours. And, it helps a lot that my mom is a former administrative assistant because she does a beautiful job of screening my phone calls while she's watching my son and I'm working! Whatever your situation, expect that there will be a bit of a training period in which you'll need to teach people what is and is not acceptable during your work hours. You might underestimate this factor because, on the surface, it seems simple. You have control over your choices, so you should have control over how you spend your work time. To invest your time in your business, you really need to be spending quality, focused time on the tasks that truly move your business forward. When you don't have a boss waiting for a project to be completed by a certain deadline, that can require a lot of self discipline. Two strategies that help me be disciplined about how I use my time are working with a business mentor, and using a simple 90 day wall calendar in my office. Both keep me accountable to the amount and type of work I have completed. I've had a couple of business mentors, and while they were each quite different, they both kept me accountable and on track, especially for tasks I really dreaded doing. If you need to get something done, and you really don't want to do it, commit to doing that task to someone you respect and don't want to disappoint. You don't need to pay for a formal business coach if that's not in your budget (although I have, and, when you find the right coach, it can be an excellent investment). But if you can find someone who you can speak with on a regular basis and commit to completing certain tasks, and who will kindly call you out when you don't complete them, you can really push forward, particularly on those tasks that are necessary but unpleasant. The 90 day dry erase wall calendar is a simple and extremely inexpensive strategy for ensuring you keep on task and invest good, focused time in your business. Each quarter, you can make note of projects you want to accomplish and write things down as you complete them. It allows you to see, at a glance, what you have actually accomplished each quarter and what you have been putting off. For years, I have tried to organize my work using lists on my computer or apps on my smart phone. Then, I read an article that said people who are more visual-spatial thinkers do better with paper planners than digital planners. A light turned on in my head, and I started tracking all of my projects on paper instead of digitally, and I instantly felt far more organized. What works for me, might not work for you, but do find a strategy for tracking your work and making yourself accountable for what you have and have not accomplished that works with your thinking style, and commit to using it. 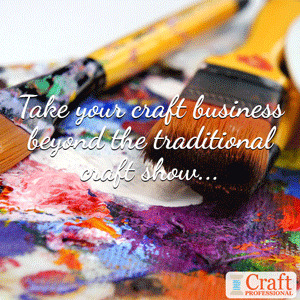 Yes, you can run your craft business on a shoestring budget. That's one of the things I love about this type of business. However, there are points at which investing a little money in your business is absolutely necessary to move forward. I'm constantly surprised when I see people who aren't willing to invest a little bit to move their business forward. I understand we all have different financial realities, and we need to live within our means, but, within that reality, if you're building a business (not just working on a hobby) you'll need to make some financial investment. Freebies are not always the great deal they appear to be, and DIYing something that is beyond your skills - particularly something that impacts the way customers view your business - is often a false economy. That is, you may save a little up front, but you end up losing more in the long term. For example, when your freebie web hosting doesn't provide you with the tools you need to bring traffic to your site or doesn't allow you to present a professional image to customers, you lose sales. If free in the short term is costing you money in the long term, then free isn't such a great deal anymore. 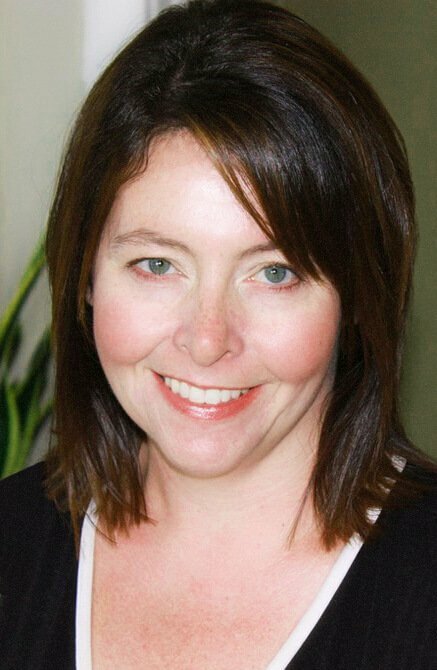 I'm not suggesting you spend beyond your comfort level to get ahead, but when you're looking at products and services for your business, don't make your choices solely on price, particularly when it involves something that customers will see and that will impact their perception of your work. Ask yourself what is the best use of your financial resources to move yourself forward. After all, you will undoubtedly invest hours of your time into business related projects; you don't want that time investment to be wasted because you chose to use a freebie or cheap option that doesn't make a good impression. I'm certainly not saying all freebies or inexpensive tools are bad! I really do run my business on a shoestring budget. I look for value in the services I pay for. But, I will spend money where it makes sense and pushes my goals forward. You need to commit to constantly learn and stretch your skills related to whatever type of media you work. Depending on what area you specialize in, this commitment may involve an investment of both of the factors already discussed - time and money. But, in my opinion, it deserves special mention because it is the crux of your business. If you are always improving your craft - either improving skills in the medium you currently work with, or perhaps learning to combine a new type of skill with your current work - you will also find that you will discover ways to stand out and be better than the competition. Perhaps your work will clearly be of much higher quality, or maybe you'll be able to offer more and different types of products because you can do what the competition cannot do. Pushing your skills and your products forward will help you to stay ahead of the market and combat those who might try to copy your success. Take time to think about the very best way to commit your time and money resources to grow your craft business. Make smart business management decisions with these tips. 19 craft business idea to help you develop a business that really works for you.